I’m 19% done, going at 4MB/s, estimated 3 hours 15 minutes remaining. But when I was still on the trial and was about this far along, it sped up to ~7MB/s, so hopefully that happens again. It’s using 100% of one CPU core, so my guess is that they’re doing all the decryption themselves, and it’s single threaded, so I’m throttled by that, not by actual disc I/O. I’m feeling pretty optimistic though, that this is the real deal — as long as it’s one of their supported discs that has a pre-extracted volume key. After this rip completes, I’ll repeat but ripping to ISO, and see how PowerDVD 17 reacts to that. First rip complete. It did take just over 4 hours, and never sped up. The trial must have sped up after I got over the 10 minute mark, and it started feeding me garbage. I can seek around the movie, and it all seems to be there, along with all of the other usual suspects in full a blu-ray rip. PowerDVD 17 can play the folder as a full UHD Disc, with menus. The final folder has no AACS dir, but does have a UHD! dir. Trying out other discs now. SINGUHD_NA took a surprisingly long time to process, but worked, and played in MPC-HC. Now for the fun one. I noticed Arrival isn’t on their list, but is the title they used for the screenshots in their walkthrough. So I popped it in… and was met with this sad message: . Luckily this seems to be distinct titles. I put Sing back in, and it recognized it without error (and processed much quick - something is cached!0. It’s now ripping. I attempted to Rip to Image, but it doesn’t seem to do anything when I click Rip. This software is obviously very hastily put together. Lots of spelling mistakes, and buttons that don’t work (the Cancel button in Rip to Hard Disk… only cancels the current rip, it won’t close the dialog if no rip is in progress. You can’t right click and get to the Rip to Hard Disk window if the main app window is already open, etc…). I’m gonna let this rip overnight, but right now it’s going at the same speed, and estimating about 4 hours. Maybe tomorrow I’ll try a remux with MKVToolNix direct from disk, but I don’t anticipate any problems with that now that I have the full version. Very interesting stuff! Those details and screenshots are great to see. Just a quick update. Sing completed overnight, and I’ve succesfully remuxed it to MKV. Everything plays back just fine in 4k HDR via my Shield. Sing even had the shorts on the UHD disc. It’s still giving me an error about too many discs in a day, so I’m unable to try Arrival. I’m doing a straight remux from the disc right now to prove that works. One other small nugget I found is in C:\Users*\AppData\Local\DeUHD there is a folder for each disc (just a bunch of hex digits). I have 4. Two of them are empty (presumably Fantastic Beasts and Arrival that it didn’t process either one), and the other two have a BK.bin file, and a Cache/uBK folder with a bunch of numbered bin files (one for each m2ts file it looks like), the total size for each disc is ~250MB. I won’t be posting any further updates for a while, as I’m heading out on vacation. @ccutrer, thank you so much for your report. You’re now pretty much the first independent source that has verified it works. I hope also the testers will provide us with such a great amount of detail on whether it worked, and if so, how it worked for them. i can also confirm the software DEUHD Rips and REMOVES AACS 2.0 from 4K UHD Blurays as i “Ripped” The Martian, Passengers, The Fate of the Furious and Sully 4K UHD Blurays Sucessfully with NO Problems, now waiting on them to update there server so i can “Rip” more 4k uhd blurays :), NO Intel SGX Needed!! Tried it with the LGWH16 (listed as recommended) on an older Windows 10 PC. Every movie I inserted scanned and then it said it was not supported movie. Did the PC make a difference? If I were to buy a license, would it work on this PC vs. the old i5 PC? Unfortunately $200 is a lot of money only to have a license and software tell me each time the disc is unsupported. And yes, they are all titles listed on their site. Not buying it or any reports until the trial removes these silly roadblocks. PC made no difference. Note that I don’t have SGX enabled or PowerDVD installed. Congrats to DeUHD for being able to decrypt some discs but unfortunately I can’t recommend this program to anyone. If you don’t mind throwing away EUR200 for software that supports only a few titles and has really bad usability (slow read speed of discs and dosen’t cope with all titles on supported title list) go ahead. Already there are other parties ripping discs that DeUHD can’t handle. DeUHD is missing support for quite a lot of old titles and they don’t seem to fast with new ones either so only time will tell what we will be able to decrypt with this software. I’ve now tried all of my UHD discs. I own 18 titles (19 discs), of which 5 (6 discs) are on DeUHD’s supported list as of 10/9/17 (and using 1.0.0.2). It can successfully decrypt 2. So… I’m at ~11% coverage of my collection. I’ve sent all of my AACS folders to DeUHD, so fingers crossed that next week’s update substantially increases my coverage. That’s actually quite a good point, you can send them details of titles that aren’t yet supported. I’m 0 for 2 so far. One disc isn’t listed as supported so the failure was to be expected. The other disc was on the supported list and I received a not supported message. Unfortunate. Over time I’ll work through the discs and see if I manage to find a supported one. I too have been using DeUHD for a week now. I have tried several discs and so far the only 2 I’ve got to work is The Martian and Guardians of the Galaxy 2. Guardians took a few tries to get working and took at least 5-6 hours to complete. The Martian worked the first time with the software version 1.0.0.2 and I got an average of 7.5 MB/S. I plan on trying the rest of my UHD collection to see which ones work and which ones don’t. I have 2 LG WH16NS40’s, and a Corei7 with 16 gigs of ram with numerous SSD drives that I rip to. Once I rip to an image I’ve used DVDFAB to create an MKV file to play on KODI and POWER DVD 17. Since this is an early version I don’t expect everything to be perfect. I’m just very happy that I can rip my discs to my NAS servers. I appreciate the fact that the Arusoft has given me this capability and a version of the software to test with. I will continue to legally purchase my discs and rip them myself. I will provide as much feedback as they need to aid this project. What do we need to send them and how? For Guardians, I watched the 1st 30 mins. There was one audio dropout for a second or two. It will also fail to remux into an MKV container using mkvtoolsnix; i played back the raw m2ts. I’m going to try and re-rip. Will also have to watch all three all the way through to confirm the rip. Of my 20 titles (22 discs), 8 titles (10 discs) are claimed to be supported, but only 3 actually are. I’m at 14% of my collection actually ripped, even though “on paper” 45% should be. Put another way, only 30% of the discs that should work, do work. While I can’t fault DeUHD for discs having region specific discs (presumably), it is very frustrating that the only way for me to know a disc won’t work is to actually put it in and try. It would be nice if their website listed the region they acquired the disc from, instead of just the audio and subtitle tracks, since that’s obviously not enough to uniquely identify discs. That way I would have a better idea if it’s going to work before buying a movie (for example, a movie I already own on Blu-ray there’s no point to me upgrading to UHD if I can’t rip it; new titles I don’t previously have I always purchase on UHD if it exists). And now that I say this and re-examine their support page, it looks like they are adding region information for some of their discs, but not all of them (not even all the new ones). Hopefully they can backfill all of this. And I curse myself that for Planet Earth II I imported the UK version, rather than getting the USA version, and it looks like the USA version is the one that DeUHD supports! 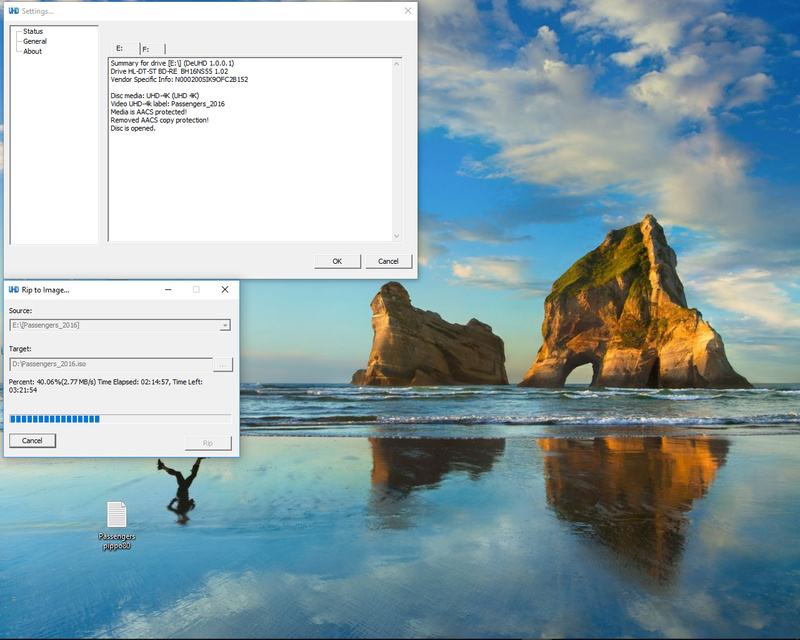 It should be noted that I was able to rip a 20171016 disc with DeUHD 1.0.0.2; I didn’t need to update to 1.0.0.3 (it hasn’t been clear if installing the update is necessary each week). Now to retry a few discs just-in-case that fixed them! US versions from BD/UHD disc sets.